Why is etiology so important ? The genetic epigenetic theory for the first time permits to explain ALL observations made on endometriosis. Most lesions grow for a certain time but growth is self limiting. When we make the diagnosis most lesions are no longer growing. Some however either are still growing, or will keep growing. Most important is that subtle endometriosis is normal endometrium implanted on the peritoneum, with some metaplasia. This is not a disease and does not cause pain or infertility. Endometriosis thus can be considered a benign tumor. not a recurrent disease : if removed completely there are no recurrences. New lesions however can develop. not a progressive disease in most women. 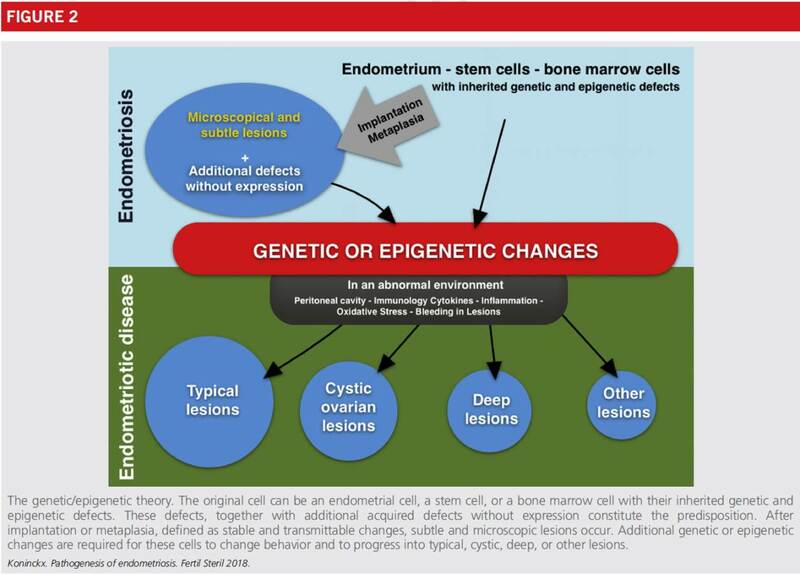 Endometriosis is heterogeneous : the type of genetic and epigenetic changes varies. Therefore in most women endometriosis is no longer progressive when the diagnosis is made. However some endometriosis lesions are different, and can remain fast progressive or can react differently to medical treatment. In 1921 Sampson proposed that menstrual cells that arrive in the peritoneal cavity by retrograde menstruation can implant and can develop further to endometriotic lesions. This theory is attractive since it has been proven that retrograde menstruation occurs in most women, that this fluid contains viable cells and that these cells can implant. Key in this theory is that endometriosis are ‘normal cells in an abnormal environment’ ie the peritoneal cavity. This theory fails to explain why progression occurs in some women only or why endometriosis is heriditary. Metaplasia theory is based upon the fact that mesothelial cells in the peritoneum can be transformed by menstrual blood into endometrial cells. Progression and further development is identical to the implantation theory. Haematogenic spread explains the occurrence of endometriosis in the lungs and on the pleura. In deep endometriosis endometrial cells are found in 50% of women in the lymph nodes. The significance of this is unclear. endometriosis starts with retrograde menstruation, inplantation of these cells and unavoidable progression thereafter. This leads to incomplete surgery if recurrenses are unavoidable. Progression only occurs following genetic or epigenetic changes as occurs in benign tumors. 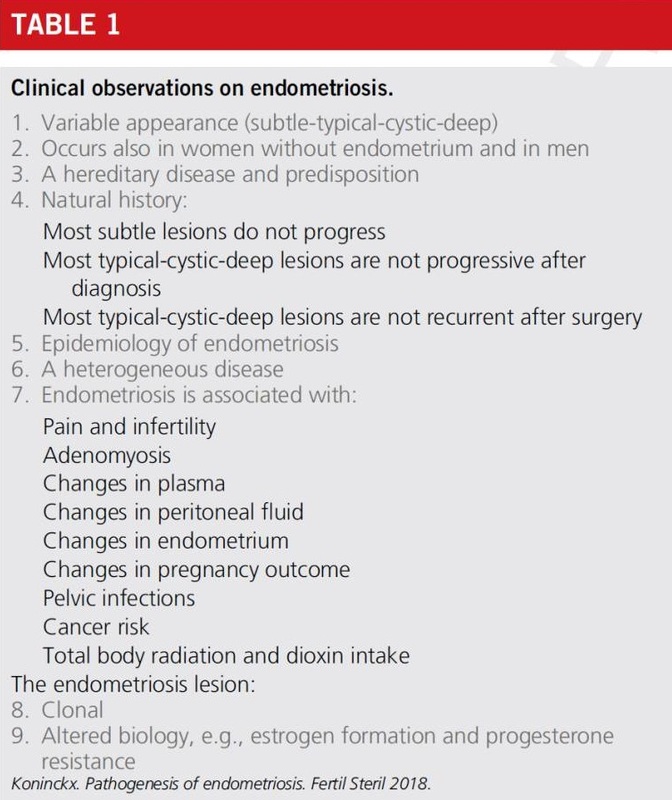 this figure is so high when subtle endometriosis is considered erroneously as a disease. Since almost all women have subtle lesions, finding subtle lesions should not be considered as an explanation for pain or infertility. deep infertility (?) pain (+++ in 95%). Subtle is not a disease.